You did it! You have decided to study English in the USA and you have chosen a school that has experienced teachers, great locations, and is fully accredited—you are coming to Bridge! What’s next? First things first, you will need to think about which program you would like to study with us. With several distinct programs and many more courses, Bridge offers you the opportunity to choose the one that best fits your needs. Begin by asking yourself: Why do I want to learn English? Is it for work or a promotion, or perhaps for school? Or maybe you want to improve your fluency for whatever may be in store for you? We can help. Below you will find some information on our English programs, including classes at our Denver language school and our university partners. General English – conversational, communicative and fun! If you want to improve your overall English, without a specific focus, our General English program is for you! It’s open to students of all levels, and has courses beginning at just 15 hours per week. The classes are structured around interactive, conversational English rather than teacher lectures—so you’ll have plenty of opportunity to improve your English speaking skills! Courses begin every Monday, and we are open all year. You can choose between four different course levels, ranging from semi-intensive group courses to private instruction. If you are a professional who needs English for work, our Business English Institute® is perfect for you. Our classes have a maximum of 6 students, our teachers are Business English professionals, and the curriculum is designed to help you succeed. Tailor your experience to your professional field with private classes for industry-specific studies such as human resources, law, engineering and finance. Additionally, all Business English courses include participation in our Executive Enrichment program, where you can apply relevant new language skills while attending lectures, workshops, and networking opportunities. Courses begin at 15 hours and go up to almost 38 hours; we include a variety of hours and intensity so that you can choose the time commitment that works best with your busy schedule! Do you want to delve deeper into American language and culture while perfecting your English skills? The Live & Learn English program offers the opportunity to do just that! This is an ideal program for au pairs living with American families; it fulfills the education requirement for au pairs on a J-1 visa, and helps you communicate effectively with your host family and community members. The course is offered in 6-week terms, with 6 hours of class per week. If you need more or less hours, the program is flexible and can be adjusted to suit your needs. This program is for students who want to attend a US university and need preparation in Academic English to succeed. 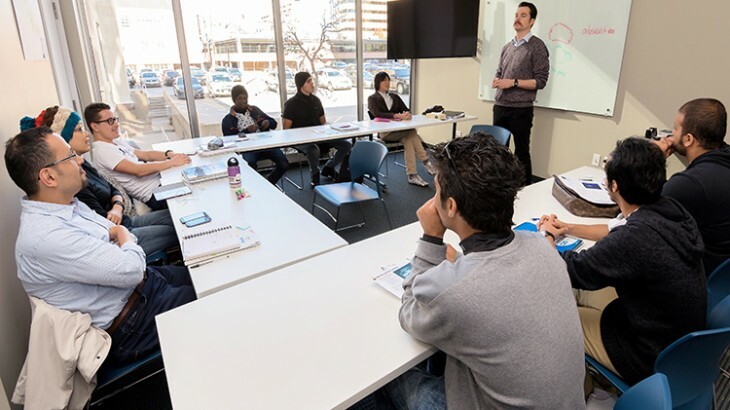 We offer this program at 4 university locations in the US, including our headquarters in Denver, to help international students achieve their English-learning goals. This course has lectures, group discussions, essays and critical thinking exercises so you can improve your academic skills and gain admission to your university. You will be in a supportive class environment for 24 hours every week with students who have the same aspirations as you. We know this is an important decision, and we appreciate you choosing Bridge. As you can see, we have many different options, and we are here to help you choose the best one. Another great source for answers is our own students! Make sure to find us on Facebook and join a community of thousands of students who understand the Bridge experience. Ready to apply? Get started now with our Preliminary Application. This post was originally published in May 2015 and was updated July 2017.
Business English, esl-blog, General Info, Our Schools, Programs academic English, BridgePathways, business English, Denver, general English. permalink.